Buffalo Check Meets Alpine Adventure! 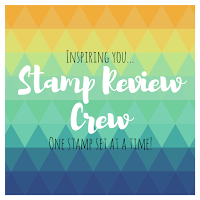 As promised in my previous post this week, the Buffalo Check Stamp Set is pairing up with the Alpine Adventure Bundle for the Stamp Review Crew Blog Hop! Two of my favorite items from the 2018 Holiday Catalog! With a Stampin’ Trimmer, cut a piece of Basic Black 12x12 Cardstock to 4 3/4″ x 12″. Score and fold at 6″. Cut a piece of Wood Textures 6x6 Designer Series Paper to 4 1/2″ x 6″. Adhere with Snail Adhesive. Cut a piece of Basic Black Cardstock to 4 1/4″ x 5 1/2″. Adhere with Stampin’ Dimensionals. Cut a piece of Cherry Cobbler Cardstock to 5″ x 6″. Use a Stamparatus to stamp the Buffalo Check Background Stamp in Tuxedo Black Memento Ink. Stamp as many times as needed to get desired coverage. (3 times works for me). Trim the cardstock down to 4 1/8″ x 5 3/8″. Note: I followed the outside lines of the dark check rows all the way around and the result is a perfectly sized top-layer for a card base. Cut a piece of Wood Textures Designer Series Paper to 3/4″ x 4 1/4″. Adhere to the buffalo check cardstock with Snail Adhesive. Cut an 18″ piece of Black 1/2″ Satin Ribbon. Wrap around as shown and secure with a bow. Stamp two feet buckles & snow shoe images in Versamark onto Wood Texture Designer Series Paper. Cover with Black Stampin’ Emboss Powder and set with a Heat Tool. Crop with the coordinating framelits from the Alpine Sports Thinlits Dies. Crop two runner sleds with a Big Shot and framelit die. Cut one down so you have the “wood” pieces as shown. Press the “Merry” element and one of the runner sleds into a Versamark Ink Pad. Cover with Black Stampin’ Emboss Powder and set with a Heat Tool. Repeat until you have the desired coverage. Adhere all images and elements as shown with Stampin’ Dimensionals. Stamp the “Christmas Greeting” sentiment in Versamark Ink onto Basic Black Cardstock. Cover with White Stampin’ Emboss Powder and set with a heat tool. Snip apart with a Paper Snips. Adhere with Snail Adhesive. The Festive Farmhouse Elements look fabulous embossed in Basic Black Stampin’ Emboss Powder. Just press the element into a Versamark Pad, cover with any color embossing powder and set with a Heat Tool! Need more coverage? Repeat the process until the desired thickness is achieved. Mine has two layers, which covered the element perfectly and gave it a little pop! Repeat the embossing technique with the runner sled. After you finish with embossing, crop another runner sled in the Wood Textures Designer Series Paper, snip out the “wood” pieces with a Paper Snips and adhere with Fast Fuse. Did you know that Fast Fuse is back and offered with a deep discount on the clearance rack? I am stocking up again, are you? That background is like a warm flannel shirt! Wintry and wonderful! exactly the feel I was going for, thanks Linda! You’re right! Your car makes me want to cozy up in front of a fire! Really cute! One of my fav things to do, cozy up in front of a fire :). Once again you rock this, Stesha!! LOVE this with Alpine Adventure. The red and black plaid is perfect. You have a great eye for detail. This fuels my #madforbuffaloplaid! Beautiful match up! These are perfect pieces together. Love this! These go together so well I was debating about using this set instead. lol Love all the little details on this. Thanks, Holly! I love adding those details. I can see that I am going to have to order this stamp set now. I had been telling myself I did not need it. You have proven me wrong!!! What a great card Stesha!!! You are such an inspiration. Thanks for sharing those wonderful ideas that you have!!! Thank you so much, Joan! My goal is to inspire and when I hear that I have, it makes my day and this gig of mine so much more rewarding than it already is! Beautiful, Stesha! Thanks for the tip about heat embossing the festive farnhouse elements. WOW! Your card is simply stunning. Great layout, beautifully detailed – this should get framed! Ahhh, that is so nice of you to say, Adriana! Thank you so much! This project has a wealth of detail — I can hardly stop examining it! Beautiful and inspiring work, as usual! Thank you so much, Debra! I love what I do and I hope that shows in my work! Wow! Once again you really make this stamp set and dies come to life. I really hadn’t noticed this new set but now that I see what you can do with it…I want to add this stamp and die set to my wishlist. I have the buffalo stamp and have enjoyed playing with it. I have always loved the “outdoorsy”type cards. Your projects help me to see new ways to use these wonderful stamps. Thanks so much, I just love your Blog! Wow,wow, wow! Absolutely amazing card! I have a quick question about how you made the sled on this card. How did you get the black frame on the sled and yet used the wood grain paper on the boards. Did you run the sled through one time with black cardstock and then a second time through using the DSP?